What's New - Florida Spring and Axle Service, Inc.
We recently purchased and installed The Shaftmaster by Superior Driveline. We have two Shaftmaster factory certified technicians here at Florida Spring and Axle who are trained to use this machine for all of your driveshaft repair, service or rebuild needs. The Shaftmaster by Superior Driveline is a complete driveshaft rebuilding and balancing product capable of pressing, welding, straightening and balancing driveshafts in one unit. The Shaftmaster remains the most powerful drive shaft manufacturing and repair machine in the industry. 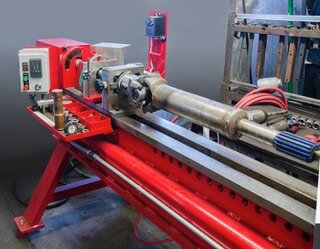 The rugged ten ton hydraulic ram press provides a tight and true press fit for precision alignment. The Shaftmaster by Superior Driveline is a complete driveshaft rebuilding and balancing product capable of pressing, welding, straightening and balancing driveshafts in one unit. We also recently added the Combo Lathe by Superior Driveline to prep and cut driveshafts for use with the Shaftmaster.